Set against the backdrop of a grassy landscape and castle whose purpled walls serve to highlight the reels, 5 Knights is a NextGen video slot peopled with knights and princesses. The game features five reels and 25 paylines. The game also has a few bonus features. Among them are free spins games and a Slide a Wild that comes with various multipliers. 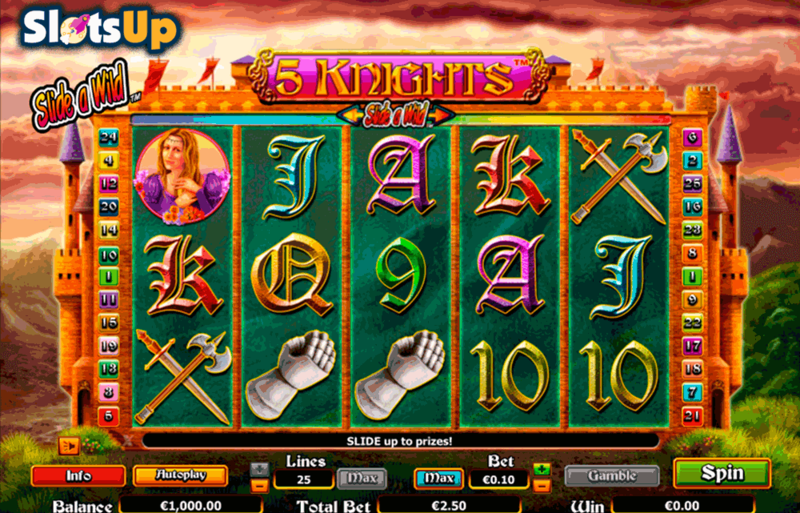 5 Knights online slot’s look and feel include a fair amount of detail. There’s a period-inspired soundtrack, as well as sound effects such as horses galloping, the clash and clink of armour and weapons, and a crowd of people cheering and clapping their hands. The graphics and animations are bright and clear, and the control panel is laid out in a way that makes it easy to navigate. The game also runs smoothly. The reels of 5 Knights are the centre of attention. They feature symbols that, when brought together in the right combinations, offer payouts as shown on the pay table. The symbols include four high value and two bonus symbols that are linked directly to the online slot’s theme, and six low value symbols that have their origins in a deck of playing cards. A knight, a princess, a gauntlet, and weapons comprise the high value symbols, a shield and a castle the bonus symbols, and nine, 10, Jack, Queen, King, and Ace the low value symbols. The shield is the 5 Knights Wild symbol, which means it can substitute for all the other symbols on the reels, with the exception of the castle, which is the Scatter symbol. The ability of the Wild to substitute for other symbols allows it to help those other symbols form winning combinations. The multiplier can be selected using the Wild Slider. The slider is set above the reels, and is used to set the reel that will offer stacked Wilds and special payouts. Whenever a 5 Knights shield Wild symbol substitutes for another symbol on that reel, it can stack to fill all positions, and multiply payouts with a multiplier that is specific to that reel. If the Slide a Wild is used to select the first reel, the multiplier is 2x; if the second reel, 3x; if the third reel, 4x; if the fourth reel, 5x; and if the fifth reel, 6x. The appearance of the stacked Wild is also linked to one of the free online slot’s more dramatic animations. A knight makes his way on to the screen, before arrows whistle through the air and force him into retreat. 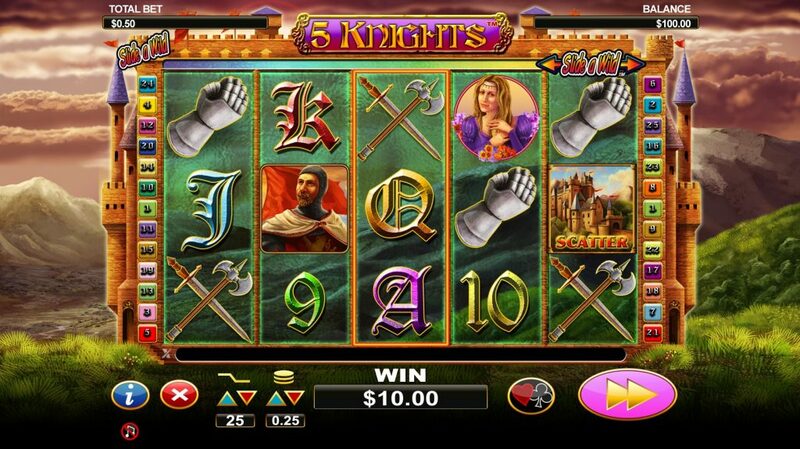 The 5 Knights online slot scatter symbol, the castle, is the symbol needed to unlock the game’s free spins round. At least three symbols need to appear, and unlike the other symbols, they do not need to appear from left to right, in consecutive order. When activated, the round offers 15 free spins, which can be re-activated if at least three more Scatters appear on the reels. The Slide a Wild is active during the free spins round. In addition, a 2x multiplier is applied to all payouts made during the round. Try your luck at 5 knights slots at Lucky Nugget Casino Canada today! Why Should You Consider Online Bingo?